Tracey Radloff is a full time Iyengar Yoga instructor at UW-Milwaukee and also teaches beginning through advanced classes at Riverwest Yogashala. She began her yoga practice with Janet Lilly at UW-Milwaukee in 1999 while studying for her BFA. Tracey found that yoga helped to stabilize her emotions, build her self-confidence, and relieve her chronic lower back pain. In her own words, “From the very beginning of my practice, yoga made me feel more comfortable in my skin.” Her teaching method is described as well-grounded, spirited, and attentive to the individual aspects of her students. Tracey has become sought out as a mentor to students interested in becoming instructors and furthering their own training in the Iyengar method. She is honored and excited to help share her years of experience and practice with those who, just like her, have recognized the unique benefits of Iyengar yoga. Alex Hansen holds a B.F.A. degree as well as IYNAUS certification for Teaching Yoga in the method of B.K.S. Iyengar. He has been studying and practicing Iyengar Yoga since 1998. Alex has been teaching yoga as his full time vocation since the year 2001 for the Dance Department at UW-Milwaukee and has been a long time part of Riverwest Yogashala. His teaching focuses on careful alignment of both body and mind through the precise instruction of the yoga poses. The greater goal of his teaching is the cultivation of healthful and mindful living. This is brought to light in his occasional philosophical points and parallels derived from the yoga poses and the experiences they create. Alex teaches beginning to advanced classes in the Iyengar method. 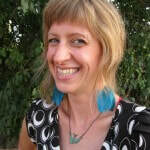 Sara Arends Haggith is an Intermediate level Certified Iyengar Yoga Teacher (CIYT). She teaches various levels of classes at Riverwest Yogashala, as well as Introductory Iyengar Yoga courses at Alverno College and UW-Milwaukee. She began studying Iyengar Yoga in 2006, while attending Alverno College, where she earned a BA in Mathematics and Philosophy. In yoga, she found her love of science and philosophy uniting, giving her an opportunity to listen to her mind and body, and respond with compassion. She studies regularly with Senior Iyengar teachers Hong Gwi-Seok and Chris Saudek. When she’s not teaching and practicing yoga, you can find her making art with her family, laughing loud, and listening to an awesome playlist as she dances, cooks, and washes the dishes. Jessica Vega Gonzalez A joyful mess. Mayan Death Dragon. The Bridge. Her mother’s daughter. A little abrasive. Not a very “nice” person. Nicaraguan. Spanish. Spanglish. A Womyn. Brown. A lot of Fire. Piano, ukulele, singing and swinging. Peace. Gratitude. Courage. Come, sit for a while. Jean Torrey-Canney began her study of yoga over 20 years ago to assist her in dealing with the stress of caring for a mother suffering with dementia. Over the years, Jean has attended multiple workshops and seminars with Chis Saudek, John Schumacher, Mary Obendorfer, Eddie Marks, Manuso Manos, Patricia Walden, and many other esteemed teachers. In September 2005 Jean attended the Iyengar Yoga Intensive in Estes Park, Colorado where she fulfilled a dream of studying with B.K.S. Iyengar. In 2006 and 2007 she studied with Geeta Iyengar in British Columbia and Seattle, Washington. Jean brings her love of yoga and compassion to each and every student in her class and is honored to be a certified Iyengar Yoga teacher through IYNAUS.